One of the biggest questions we get from our students getting their real estate license pertains to their future career path: should they keep their job and ease into real estate part-time, or take the plunge and go full-time? It’s a serious question to consider while taking real estate classes to prepare for the California exam. People have been successful in both routes, but our team feels strongly that full-time real estate is the best option. Why full-time? Real estate is unlike any other job. Statistics show that most people do not make it in real estate. The odds are stacked against you from day one and to be successful, you have to give it 110%v every single day. As an independent contractor, you are responsible for your own schedule and income. Starting part-time in real estate could turn out to be incredibly discouraging– most people try it, realize it’s hard work, and give up because it’s too demanding. Going full-time allows you to give real estate you very best shot. The time commitment is huge, especially in the very beginning of your career. To be successful before having a large client base and referral system, you have to be extraordinarily tenacious and driven in your first 6 months. This requires time, energy, and effort. To be truly successful in real estate, you have to make the sacrifice at the beginning! 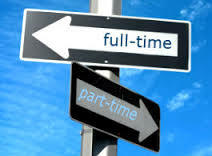 Many people say that going part-time is fine– and they’re right, to an extent. Going part-time works for some people who are looking for a few deals a year. But if you’re looking to really make a career out of real estate after getting your license, you have to think long-term. You have to take the leap and give it everything you’ve got so that you can be successful, establish good habits, and avoid giving up. At our real estate license school in Long Beach, CA, we aim high and prepare all of our students to pass the real estate exam and launch a successful career to make at least $100k in their first year. Of course, every office is very different– our goal is to be the best and we hope that if you want to join our championship mentality, you’ll choose full-time commitment and make your dreams come true! To learn more about our real estate licensing program and career development programs, come to one of our free information sessions in Long Beach, CA!